This article is about the term in Jainism. For the term Arhat or Arahant in Buddhism, see Arhat. Sculpture depicting Rishabhanatha, the first Arihant of the present half cycle of time (avasarpini) moving over lotus after attaining omniscience. Arihant (Jain Prakrit: arihant, Sanskrit: árhat "conqueror") is a soul who has conquered inner passions such as attachment, anger, pride and greed. Having destroyed four inimical karmas, they realize pure self. Arihants are also called kevalins (omniscient beings) as they possess kevala jnana (pure infinite knowledge). An arihant is also called a jina ("victor"). At the end of their life, arihants destroy remaining karmas and attain moksha (liberation) and become siddhas. Arihantas have a body while siddhas are bodiless pure spirit. The Ṇamōkāra mantra, the fundamental prayer dedicated to Pañca-Parameṣṭhi (five supreme beings), begins with Ṇamō arihantāṇaṁ, "obeisance to the arihants". Tirthankara kevalī: 24 human spiritual guides who after attaining omniscience teach the path to salvation. Sāmānya kevalī: Kevalins who are concerned with their own liberation. According to Jains, every soul has the potential to become an arihant. A soul which destroys all kashayas or inner enemies like anger, ego, deception, and greed, responsible for the perpetuation of ignorance, becomes an arihant. In Jainism, omniscience is said to be the infinite, all-embracing knowledge that reflects, as it were in a mirror, all substances and their infinite modes, extending through the past, the present and the future. According to Jain texts, omniscience is the natural attribute of the pure souls. The self-attaining omniscience becomes a kevalin. 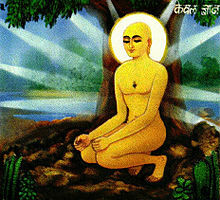 Those arihants who re-establish the Jain faith are called tirthankaras. Tirthankaras revitalize the sangha, the fourfold order consisting of male saints (sādhus), female saints (sādhvis), male householders (śrāvaka) and female householders (srāvika). These four karmas do not affect the true nature of the soul and are therefore called aghati karmas. Having destroyed the four inimical varieties of karmas (ghātiyā karmas), possessed of infinite faith, happiness, knowledge and power, and housed in most auspicious body (paramaudārika śarīra), that pure soul of the World Teacher (Arihant) should be meditated on. ^ a b Sangave 2001, p. 15. ^ Jain 2014, p. 2. ^ Jain 2013, p. 177.